Totem Power Stones with animal images and designs. Select from our standard engravings or enter your custom engraving. Select from our list of standard words, animals or designs, or request a custom engraving. 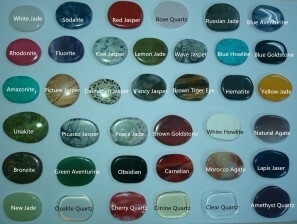 Brightly colored semi-precious gemstones 1.75" wide.